This guest list for this event is already full, and we are waitlisting members who wish to attend. Footage of the 2008 Oxford and Cambridge Boat Race will be shown at 20:30. If you wish to attend this key event in the Society’s calendar, please contact Tim Minton (t.minton[at]camford[dot]org) by Friday, 9th May. Members are welcome to invite one guest only to this event. The 2008 Annual Golf Tournament will be held as usual at Hodogaya Country Club; tee-off time for the first group is 08:18 a.m. The Saturday fee for non-HCC members is 31,360 yen, which covers the green fee (22,000), caddie fee (4,000) and other incidental expenses and taxes. Lunch (1,500) and beer/wine (300 per glass) are extra. There will be an additional charge of approximately 2,000 yen for the post-tournament party. A discount of 1,200 yen is available to senior golfers (70-plus years of age) on production of proof of age at the Club’s reception desk in the morning. The dawn chorus had scarcely subsided under the first shafts of morning light when a perfectly matched group of eight from each university assembled for the first championship of the 2008 season. Led by their respective yokozuna Thomas (Oxford) and Dalby (Cambridge), both teams fizzed with anticipation as veterans Sato (Oxford) and Gomersall (Cambridge) squared off for their first shots from the downy yellow of the first tee. In the absence of lady players, Hodogaya’s soft-bosomed (but always mischievous) nature supplied ample decoration of pink, crimson and white with its vestments of plum, magnolia and camellia, as the four flights led off with the usual competitive intent. Some dallied so deeply within the welcoming bush that scores in excess of 50 were not uncommon, though honours were still pretty even, as the sides negotiated the uphill ninth to come in for a 10.30 lunch. The second nine however brought out true form. Dalby, piqued by a few missed approaches in the matinal session, slipped into top gear. The dapper Takeno (Oxford) kept cool, and even Minton (Cambridge), a Hodogaya virgin, negotiated the curves and hillocks as if he had fondled them for years. Cambridge saved a few points in the final stretch due to the lake alongside holes 16 and 17 being drained and “under repair”, but when the final reckoning came, it was probably the steadiness of Oxford’s senior member, Sato, who carded a cheery 44 in the back nine, which gave Oxford their narrow overall victory of four shots for their 17th championship against Cambridge’s 15. As the non-alcohol beer flowed among the driving members, Takeno placed his hands on the coveted individual trophy, and an impromptu committee of elders judged that his swing had been so fluid for a player of middling handicap that the latter was summarily reduced by 5. Accepting this with true British decency, the victor brought proceedings to a close with much deserved thanks to the society’s Secretary for providing the perfect weather and setting for another close and rewarding match. Posted in Event Reports | Members only Submitted by huw.williams on Sat, 2008-03-22 00:00. Members and their guests are invited to join us for our annual Christmas Party in The International House of Japan's Kabayama Room (樺山ルーム), which opens onto the House's renowned garden. The International House of Japan has a car park, but there is no guarantee that spaces will be available. If you would like to attend, please let Tim Minton know by Sunday, 16th December (t.minton[at]camford[dot]org). As in years past the Society held its End-of-Year party at the International House of Japan in Roppongi on December 19th 2007. The venue as usual did not disappoint. The kitchens excelled themselves and there was plenty of both food and wine to go around. The 19th was unusually cold, and members were therefore unable to walk in the gardens. Our bonenkai is usually held of Fridays, and it was feared that the date falling on a Wednesday would have deterred most. But of the 62 who had registered, only one failed to make it. A very good turnout indeed. Your rapporteur also noticed plenty of new faces of the younger generation, confirming the view that the Society's future is very much assured. All in all, a good time was had by all. Your rapportuer looks forward to the next bonenkai . Posted in Event Reports | Members only Submitted by huw.williams on Wed, 2007-12-19 09:00. If you wish to attend, please contact Tim Minton by e-mail (t[dot]minton[at]camford[dot]org) or fax (044-945-5716) by Monday, 12th November. Please give your name in kanji (if applicable), together with a contact phone/fax number; please also indicate which college/university you attended. We regret that members may not invite guests on this occasion and that we will have to reject applications once our allotted number of places is reached. If you wish to attend this event, please reply by Sunday, 28th October to Tim Minton, Honorary Secretary, by e-mail (t.minton[at]camford.org) or fax (044-945-5716). Those who cancel after the closing date will not be refunded. 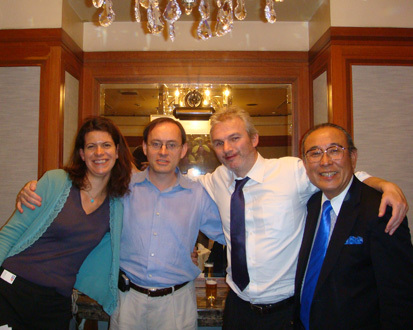 Some photos from the 9 October 2007 second tuesday meeting at the Ginza Tobu Hotel. A visit to Odaiba Oedo Onsen Monogatari formed part of the programme for the Centenary celebrations in 2005. The structure houses a selection of different pools with various mineral compositions, as well as an outdoor pool. There are separate areas for ladies and gentlemen, and an amusing Edo-style theme restaurant area inside the complex adds to the fun. The Onsen visit will be followed by a catered barbecue in Kaihin Park, which overlooks Rainbow Bridge. This part of the programme will begin at around 4.30 p.m., but details will be sent to those who apply to attend. Guests are welcome, and you may attend either or both of the events; please indicate in your reply. If you wish to take part, please reply to Tim Minton by e-mail (t.minton[at]camford[dot]org)or fax (044-945-4716) by Monday, 3rd September. 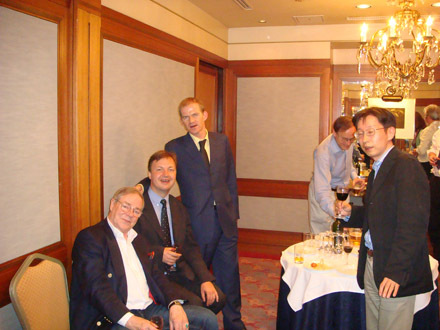 The venue for our main June event is the exclusive Ark Hills Club in Akasaka, which will be fondly remembered by those who attended the first of our centenary celebration events in March 2005; we also held an event there in July of the same year. Ark Hills Club is located on the 37th floor of the East Wing of the Ark Mori Building next to the ANA Intercontinental Hotel in Akasaka. The closest subway station is Tameike Sanno on the Ginza and Namboku Lines. Detailed directions will be sent to those who sign up. If you wish to attend this event, please contact Tim Minton (t.minton[at]camford[dot]org] by 3 p.m. on 22nd June. You are welcome to invite guests.